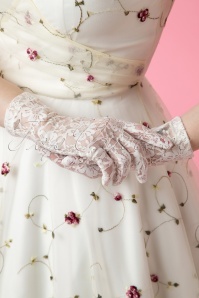 The 50s Lady Mary Pin Dots Lace Gloves are super chic! You're enjoying a cup of tea when the Lord asks you for a stroll around the villa. But of course my Lord! While getting your umbrella you put on these beauties. Made from gracious stretchy black roses lace with playful white pin dots. Fancy, just like Downton Abbey! Diese wunderschönen und eleganten Handschuhe passen perfekt zu Mänteln und Kleidern mit 3/4 Ärmeln und sollten in keinem Schrank fehlen, tragen sich leicht und angenehm.